Nursing is, no doubt, a challenging job and that is why CNAs in NJ receive hefty packages. 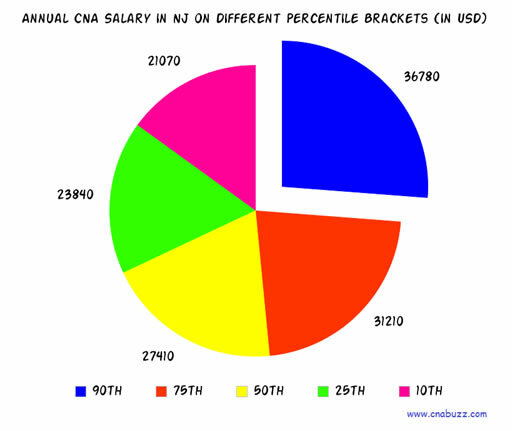 The survey conducted by the BLS revealed that the mean annual and per hour CNA salary in New Jersey was approximately $28,090 and $13.51, respectively. The state of New Jersey employed around 49,640 certified nursing assistants in the year 2013, and the employment per thousand jobs was approximately 12.99. According to indeed.com, annual income of a nursing aide in NJ was $26,000 which was luckily 8 percent higher than the average CNA earnings nationally (as of January 2015). 90% of CNAs made less than $36,780; 10% made more than $36,780. 75% of certified nurse assistants were salaried less than $31,210; remaining 25% were paid more than $31,210. 50% of the employees earned less than $27,410; rest 50% were waged more than $27,410. 25% of CNAs were paid annual wages less than $23,840; 75% were paid more than $23,840. 10% of employees were offered less than $21,070; 90% were offered more than $21,070. As per the data in the below given table, CNAs working in Camden earned the lowest annual salary i.e. $32,355. The median monthly, weekly, and hourly salary in this city was $2,696, $622, and $16 respectively. The highest yearly income of $36,240 was provided by maximum number of cities, as of January 2015. The position that a certified nursing assistant holds decides his/her salary. Like all other states, the highest paid professional is CNA Hospice, who received an annual salary of $34,000 (as of January 2015). Correctional Prison Facility CNA is the lowest paid job title receiving $16,000 yearly. The salaries of other professionals were between $17,000 and $32,000. Like other healthcare and nursing jobs, the employment of CNA is predicted to grow at a comparatively faster rate than the average in between the years 2012 and 2022. According to the Bureau of Labor Statistics, it is expected to rise by 21 percent which, in turn, generates several vacancies for aspirants. The demand for certified nursing assistants will be high in the upcoming years, primarily due to the growing advancements in the medical sector. Hence, those pursuing CNA Program courses will find enormous job opportunities. Question 1 – Can anyone suggest me some of the top paid nursing assistant job titles in the state of New Jersey? 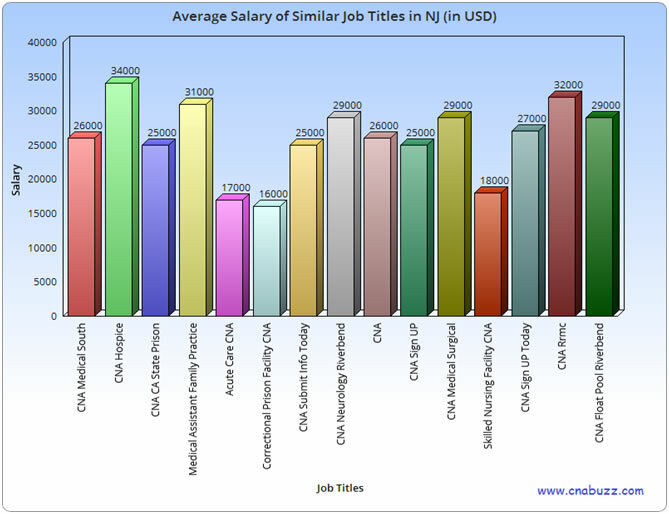 Answer – According to indeed.com, CNA Hospice is the highest paid job title with an annual income of $34,000. Other job titles include CNA Rrmc ($32,000), Medical Assistant Family Practice ($31,000), CNA Float Pool Riverbend ($29,000), CNA Medical Surgical ($29,000), and CNA Neurology Riverbend ($29,000). Question 2 – In NJ, what is the average salary of a nursing aide? Answer – According to the indeed.com, certified nursing assistants can expect an average yearly salary of $26,000.